When someone invites you to an ice cream tasting, you go. 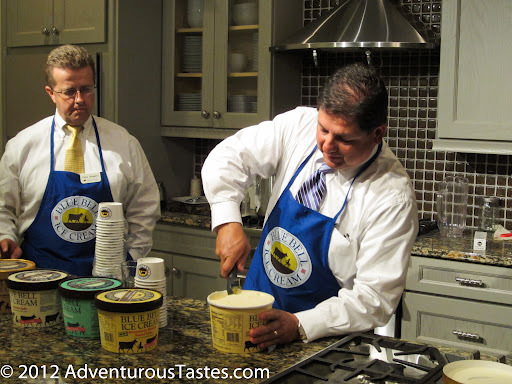 So it was with eager anticipation of an ice cream bacchanal, that I headed over to Hal's Kitchen Cooking School for a Blue Bell media event. Alas, we didn't get to tuck straight into the creamy treats. We instead began with a hokey but informative video on Blue Bell's storied history. 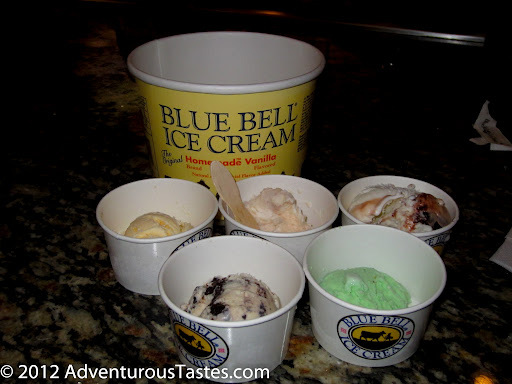 Brenham Creamery began producing ice cream in 1917 and later became Blue Bell Creamery. 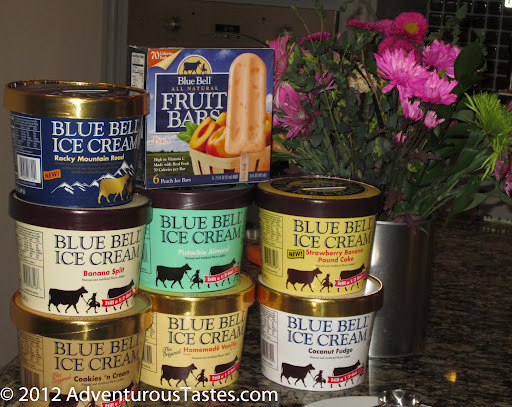 Like most of the upstart companies of the era, Blue Bell was a family affair and weathered it's fair share of storms. In the video we watched, there was a hilarious scene in which a grocer is giving the company its big break. So impressed is the grocer by the just-like-homemade Vanilla that he wants to get his hands on as much of it has he can. The sales person actually talks the grocer down from a big order to a tiny one. As someone who works in a sales driven business, I think this guy was clearly not working on commission! But as they say, the rest is history. Today, despite being sold in only 26% of the nation's grocery stores (mostly in the Sunbelt), Blue Bell is one of the top 3 selling ice creams in the US. Southerners love their Blue Bell! After our history lesson, the gentlemen from the local Blue Bell factory, got to scoopin'. You can see that we had our work cut out for us. As they scooped and we ate, they answered questions and gave us more detail on the Blue Bell of today. I've heard before that vanilla is always the best selling ice cream, and for Blue Bell it's no different. I get it - vanilla is useful for all sorts of a la mode things, but still, I can't ever imagine choosing vanilla when other delectable flavors are on offer for a no frills scoop. That being said, their vanilla is indeed the perfect balance of richness, vanilla and just the right creamy mouth-feel. This ain't no frozen ice dessert! Random Blue Bell Fact #1: Pistachio Almond is weirdly popular in Atlanta. In fact, we buy 2x the amount any other city does. I don't think of myself as a pistachio gal, but this might have been one of my favorite flavors. Each flavor was appropriately creamy and rich, but there was something subtle and very appealing about pistachio almond! Random Blue Bell Fact #2: Blue Bell actually invented Cookies 'n Cream ice cream. God bless America, is that a great invention, or what? We learned that they have their own bakery on site so that they can make all the mix-ins themselves. Other flavors we sampled included Coconut Fudge, Strawberry Banana Pound Cake (new and one of my favorites) and Rocky Mountain Road (and example of the regional special flavors they do - this one for their recent launch in, you guessed it, Colorado). Random Blue Bell Fact #3: Blue Bell has been eaten in outer space. In 2006, astronauts aboard the International Space station enjoyed Blue Bell ice cream to "help out (the crew's) happiness quotient." I was a good little girl and didn't finish all of my ice cream, but let me tell you, it was not easy. I rarely eat ice cream these days, but Blue Bell is pretty darn good. My one qualm? For a company that still feels so old school, I'm disappointed they have high fructose corn syrup in all of their products. Surely regular sugar is more authentic to the homemade ethos? Heck, Blue Bell is still so old fashioned, they don't even have a Facebook page, so here's hoping they eventually hearken back to the good ol' days when Mr. Kruse surely sweetened his ice cream with real sugar. I tried asking about it, but they masterfully punted and turned it into a question about the merits of butterfat. Oh well, nothing is perfect. 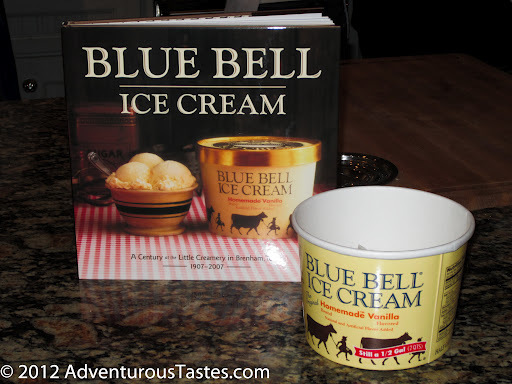 Blue Bell is indeed delectable, still comes in a true half gallon, and has plenty of yummy flavors. We walked away with a coffee table book on their history and a coupon for a free half gallon. I might have to put aside my HFCS qualms soon so I can tuck into another bowl of that pistachio almond!